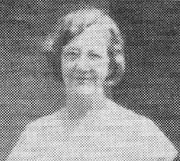 Gaines, Helen Fouche (1888-1940): Born in Hot Springs and raised in Lake Village, Ms. Gaines graduated from Little Rock High School in 1906 (she was co-validictorian). It is believed she worked as a cipherer for the Navy during World War I. In 1929, she joined the American Cryptogram Association (ACA). From 1933 to 1939, she published thirty-four articles in the ACA’s publication, The Cryptogram. Ms. Gaines published Elementary Cryptanalysis in 1939, still considered one of the official books of the ACA. Helen Fouché Gaines is currently considered a "single author." If one or more works are by a distinct, homonymous authors, go ahead and split the author. Helen Fouché Gaines is composed of 6 names. You can examine and separate out names.